What is Sarahah and Why is it Raising Concerns of Cyber Bullying? Every once in a while, there comes an app that gets immense attention. There are apps like Prisma that garner overnight popularity for their sheer creativity, and on the contrary, there are apps that top the charts by sparking controversies. 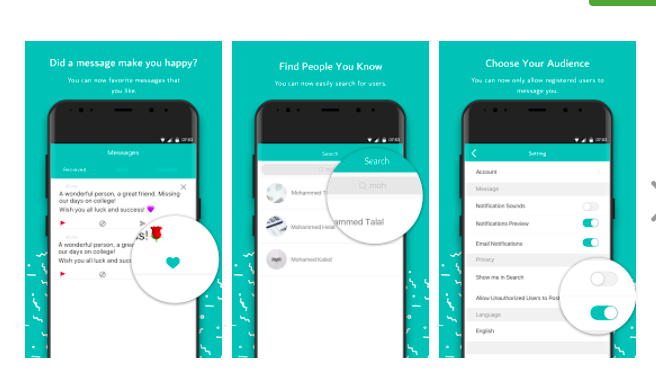 One such app that has recently gained popularity is “Sarahah”. 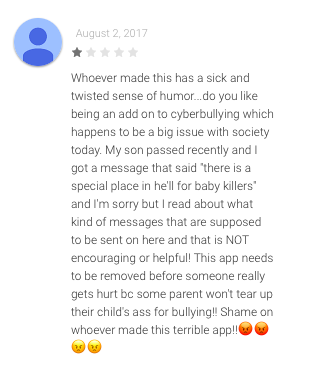 This app has alarmed parents in the US and the UK as it is posing as a convenient way for teen cyberbullying. Teenagers constitute the principal share of users for Sarahah and it is raising concerns of all sorts. If you haven’t heard of this app yet (good! ), then let us explain it to you. Sarahah is an anonymous messaging service like sayat.me that lets users send anonymous messages. All they need to do is register on the app and pass on the link to their profile to friends or even post it on public platforms. Anyone who has the link to the profile can send you messages without revealing his/her identity. You have absolutely no way to track who sent you the message. Sarahah started as a website for organisational purposes, allowing employees to share their feedback about the company without exposing their identity and jeopardising their career. It is created by a Saudi Arabia based developer Zain al-Abidin Tawfiq, who later realised that this concept could very well be applied to personal use too, involving friends and families to share feedbacks without revealing their identity. Tawfiq opened a new section on his website for personal feedback from friends, and it soon became popular in the Middle East and Africa. However, this was just the beginning of a bigger chaos as the app debuted in the West. On June 13, 2017, Tawfiq went on to release an app for Sarahah on both iOS and Android. In no time, the app started trending and soon topped the charts on both the app stores. With its Snapchat integration, the app became more popular among teens. And this is where the trouble started. The reason Sarahah gained such popularity in a short time is that it lets users say anything and everything without any consequences. The anonymity factor ensures that no one can be accounted for whatever filth they spew online. Giving such a platform to teens doubles the risk of cyberbullying as they are not mature enough to handle such freedom of expression and they often go to lengths that can be seriously harmful. As expected, Sarahah soon started troubling users. Many parents and their children reported that Sarahah is giving encouragement to cyberbullying. 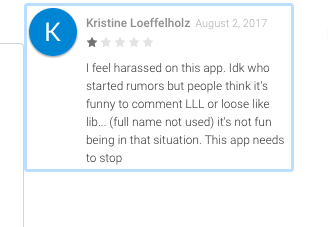 While NY Mag’s Select/All column says that they have not received any hateful messages at all, there are user reviews on the Play Store that describe the app as dangerous. 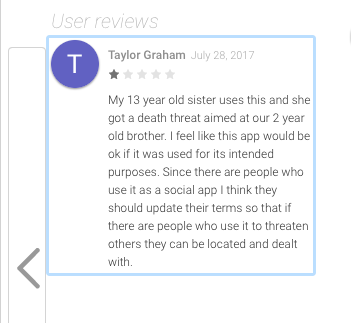 One such review by Taylor Graham on the Play Store reads, “My 13-year-old sister uses this, and she got a death threat aimed at our 2-year-old brother”. 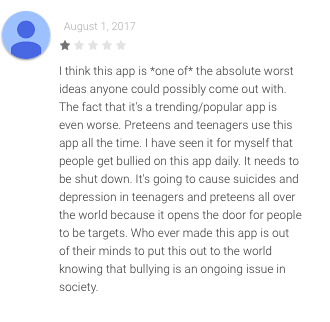 Of course, it mainly depends on the discretion of users on how to use the app, as it all can’t be blamed on it, but, if a 13 year old is using such an app then it is certainly alarming. 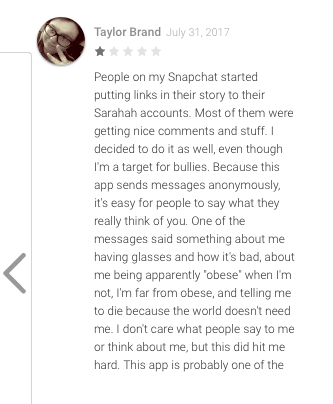 Cyberbullying is not a new concept on the internet, but we think apps like Sarahah encourage it further. The anonymity factor of such apps gives an undue push to the trolls. Particularly for the teens, apps like Sarahah could trigger unpleasant circumstances.